Dimension:4 Inch x 4 Inch x 6.7 Inch, 1.1lb. This fully functional old world mill grinds coffee beans for fresh, home brewed espresso & java; It also grinds spices, nuts & herbs. Take out this unique coffee grinder for an authentically old world coffee experience. It's vintage design makes a great addition to your kitchen decor. 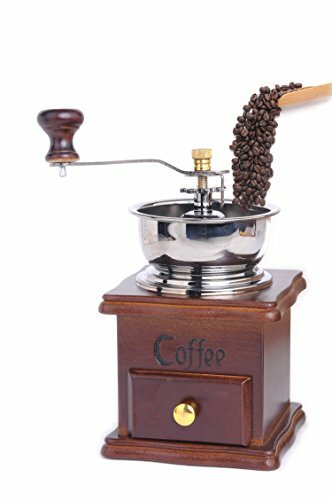 Antique Wooden Manual Coffee Grinder Grinds Coffee Beans for Fresh, Home Brewed Espresso & Java; Also Grinds Spices, Nuts & Herbs，Pure wood bottom base with drawer, super convenient and easy to operate。 but also one more step closer to nature. Pure wood bottom base with drawer, Mix spices like clove or cardamom and experiment with new .super convenient and easy to operate; Ceramic grinding core, can be washed easily, no metal smell, avoid raw heat affecting flavor. We suggest you clean it once a week. If you have any questions about this product by Jomin, contact us by completing and submitting the form below. If you are looking for a specif part number, please include it with your message.